I got draw to hunt Hovey Lake on 11/30 choice 10 any suggestions. Never hunted this lake. Any reports in that area. Hunted South East Johnson County evenings of 25 and 26 October 2014 and saw not a single duck or Canada Goose in some 6 hours combined in the field. Hunted Atterbury on the 26th. On 23 and 24 October I observed many flocks of both ducks and geese flying, grazing and landing South of Greenwood, Johnson County. On the 25th and 26th not one. It’s as though on opening day they all packed up and left for ???? We ended up with another goose yesterday. Might be back at it on Friday if I get a snow day. We bought Kentucky licenses to get one last duck hunt in today. 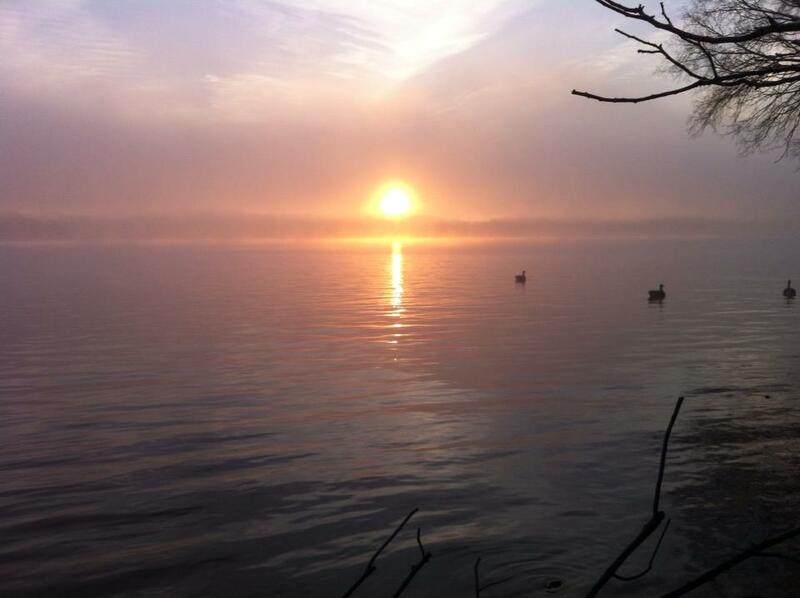 There was a lot of fog on the river early, and ducks didn’t start flying until around 7 or 7:30. We worked a few groups and had one group locked up and sailing in around 8. Shooting across the river jinxed us. They picked up, worked us a few more times, and went elsewhere. Fitting end to our season! We worked a few geese as well. No shots fired but we had a good time. Cheers for the 2013-2014 season. Man am I getting old. Time is flying. I did get a pretty picture shortly after daybreak. Our duck season went out with a whimper this morning. We saw one duck. However, geese were flying all morning. We ended up with five but lost a few others. Not too bad. We’ll be chasing them again in the morning. Good luck on the geese Bert. Shoot ’em in the lips. Cool new stuff on the site. We had two hunts over the weekend. 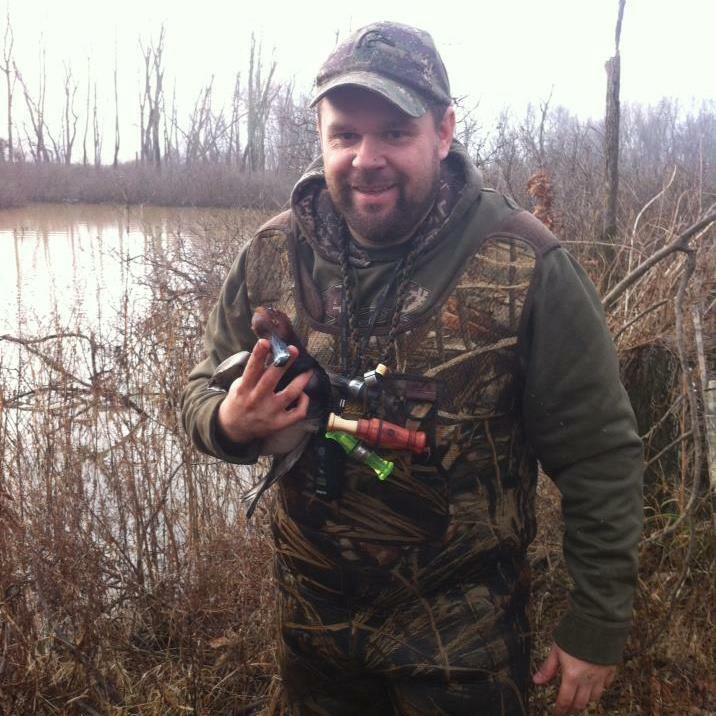 On Saturday we saw about two hundred birds, the most all season, and worked mallards about every twenty minutes. We didn’t shoot so well and blew some other chances with the dogs out on retrieves. I took a gorgeous red head drake. Wow. What a moment. Needless to say it will be going to the taxidermist. We ended up with a drake mallard and the read head. Sunday Dad and I hunted in the rain. Saw about twenty ducks. We hunted a flooded field and I thought we would do better. I missed a few teal. No birds on Sunday. Nice pic. Better late than never on the birds. Had one diver day like that in WI this season with the kids. All the other days were “scratch out a few ” days. Looking forward to all posts and pics in the new system.